It is hard to write this post without sounding like a hyperbolic infomercial but we are that eager to spread the joyful news about an especially useful tool combination, the Milwaukee Hackzall with the Lee Valley pruning blade. The two make a fantastic woodcutting team, which only a lightsaber could beat. No arborist should be without one! (And extra blades and batteries, of course.) But if you need more than our enthusiasm to be convinced then read on. Or if you really don’t care then, sorry, feel free to read something else. Much of our outdoor work involves removing storm-fallen trees (especially from our driveway) or making and maintaining trails by pruning or felling saplings. The mighty gas-powered chainsaw is the traditional tool for these operations but we are ever reluctant to use it. It may be the most intrinsically dangerous tool we use. In addition it is noisy and smelly and never seems to go very long without requiring the chain to be sharpened, either a tedious procedure or trips to the hardware store. The chain also requires attention to its lubrication and tension. And, of course, there is the awkward starting ritual of the two-stroke gasoline engine. We addressed the noise and smell and avoided the starting ritual by trying a small cordless electric chainsaw but it proved underpowered and ran out of charge quickly. In addition it still had the dangerous and quickly dulled chain as well as the messy chain oil. Larger and more powerful models than ours are available but they are also significantly more expensive and we were reluctant to invest in a trial. We had largely reverted to using a manual bow saw for nearly all of our sawing. Requiring more effort (which we shall call an exercise program) it is much quieter and less treacherous and actually seems to cut nearly as quickly as a chainsaw until one’s arms tire. Also dull blades are fairly easy to change for new. Still we wished for the convenience of a safe and effective saw powered by something other than ourselves. Having successfully used a corded reciprocating saw within extension cord range of the house we considered whether a cordless version would serve. Our search turned up the Hackzall, a reciprocating saw without the usual nose heavy shape. Better balanced, it can somewhat safely be used one-handed. 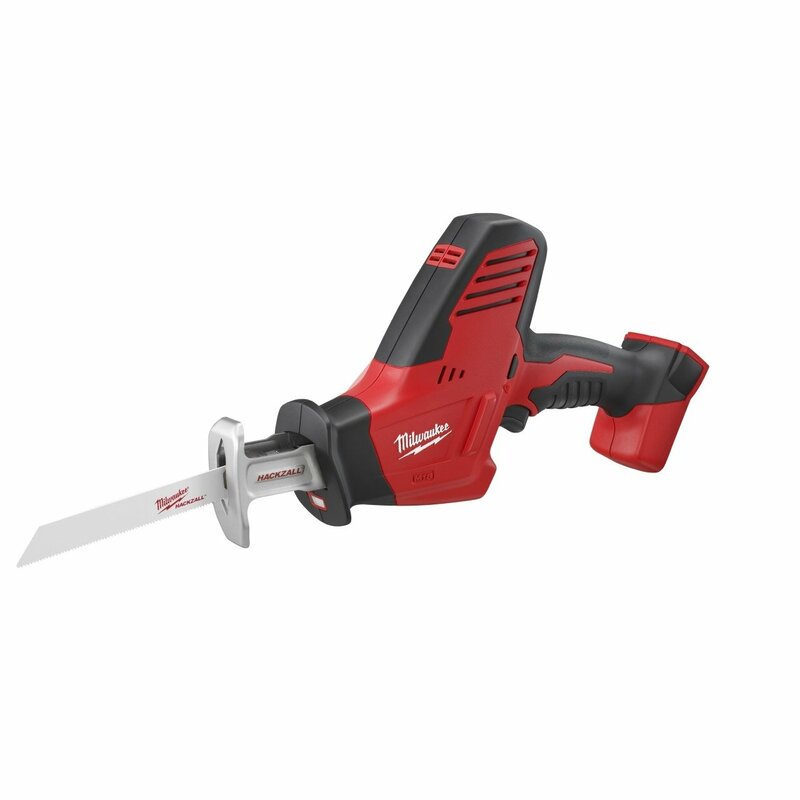 It reintroduces some noise to our sawing but no smells, no lubrication, and no sharpening. Blade changes are trivially easy, requiring no tools. Twist a collar, pull out the old blade, put in the new, and release the collar. It accepts any of the usual Milwaukee blades and their knockoffs for its intended rough carpentry uses (We used it during our cutout adventure.) and long “pruning” blades are available although the ones we tried worked best on dead wood. Feeling satisfaction with our new powered sawing capabilities we achieved genuine elation when we discovered the Lee Valley pruning blade. It resembles the kind of blade that is usually attached to a telescoping pole pruner but has a shank to fit most reciprocating saws, happily including the Hackzall. Cutting as easily through green wood as dead, with the curve of the blade helping to pull the wood into the cut, it is removing much of the tedium from our ongoing job of clearing the abundant dead wood of windy years and ash borer. I have some split rails to cut, and this looks like a good option. Truthfully, I’m hoping my neighbor will cut them for me 🙂 But if not I plan to try this out. Thanks for the post. Felling and splitting yourself or just cutting store-bought to length? If the latter you could probably get by with some suitable, less expensive Milwaukee blade(s) in the Hackzall. Store bought. Was thinking of trying cheaper blades. Thanks again. Oh. My. Goodness. This news may well change how I go about removing some sadly deceased trees. (Though it would mean forgoing the chips that The Tree People can make of downed corpses….) Thank you! I bet the Hackzall would be good to saw bamboo. Right now it’s difficult to cut it low enough to get the mower over it. I could saw it slightly lower than ground level with the Hackzall. Furthermore, I can charge the batteries with my solar system and stay away from using fossil fuel and polluting the air. A big win-win. The Hackzall should be ideal although bamboo is supposedly really rough on blades. The Lee Valley should cut well but may last long enough to be worth the price. It may be better to run through a pack of cheaper blades. Do you get any commission from people buying this from your website? I’m thinking again about getting one after tripping on those bamboo roots. First of all, you will want the 18V version rather than the 12V to which our post used to link until a few seconds ago. We have been meaning to update it forever and your question finally panicked us into doing so. Second, yes, our Amazon links involve their associate program so we may get a few dollars someday. We are not counting on it and if you find a better deal at a local big box store then by all means go for it. Third, happy hacking. We just had a fun Saturday of felling, cutting, and chipping, followed by NSAIDs with dinner.